People find gypsies very mysterious and dramatic. They are dark and attractive and have a dressing style and makeup of their own. Some are scared about them while others find them very fascinating and want to know more about them. Gypsies have been known to exist from about 14th century onwards. They have their origin in the Northern India in the state of Punjab later on they entered Europe. Now they are found mostly in Europe and America. They are nomads and wander from place to place. They love to travel and find new places. They are believed to be good fortune tellers. The way they dress make them easily get noticed. The vibrant colors used by them and the chunky trinkets they use attract all. These complement their bold personality. Here we will discuss about the makeup and hair style of the Gypsies. Just as you do in any other makeup, here also you start by applying a foundation. However, for the look of a gypsy, you need to choose a foundation that is a few shades darker than your complexion. This will give you a sun-kissed glow like that of a gypsy. You will look dark and exotic. You must not only apply this shade on your face and neck, but also to other parts of your body that are exposed. If not, your face will look dark compared to your arms and other exposed parts of your body. If you have met a gypsy, you must have certainly seen their eyes. Their eyes are the most attractive part of their persona. They are smoky and very mysterious. So blacken your eyes heavily and beautifully so that they are black and attractive. After applying the primer and concealer, you may use shades of gold and bronze along with black. This helps in getting beautiful smoky eyes that can captivate anyone. On your upper and lower lash you can use kohl. Then apply the liner in a winged fashion. Using lash extensions or the max factor false lash mascara is the best way to enhance your lashes. Black eyes with thick and long lashes are what gypsies have. If you want to look more dramatic, you may use green contact lenses as well. 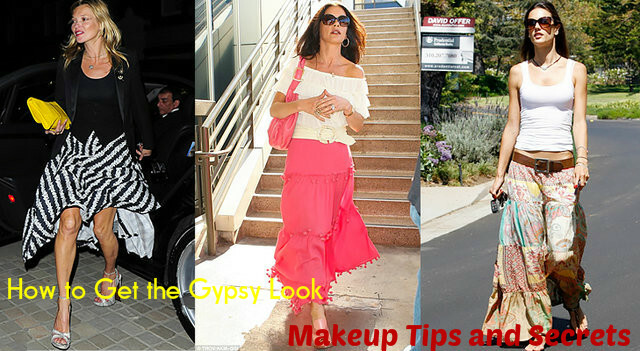 Just like the eyes, lips are also the centre of attraction when you go for a gypsy makeup. You can choose vibrant colors for your lips like red or reddish-orange colors, as well as maroon or purple colors. You can choose the color according to your skin tone. If you have a lighter skin tone, you may choose dark maroon or purple and if your skin is tanned or if you have an olive skin tone, you may choose different shades of red. The deep fiery colors that you use go perfectly well with the gypsy style that you want to try. After applying the lip color, you can finish it off by dabbing some colorless lip gloss at the centre of your pout. For the makeup of the cheeks, you have to first highlight your cheeks by using a highlighter. Also highlight your brow bone and the nose. You must have noticed that gypsies always have a beautiful glow on their face. So choose a peach-toned or rosy blush for your cheeks. Apply on the cheek bones and then spread the blusher towards your ears, so that it blends well with your skin and looks natural. After you are done with your makeup, you may attach little stones at the corner of your eyes or make a tiny V at the centre of your forehead with the tiny stones. You may also draw tattoos on your neck and arms using kohl. Putting a beauty spot near your lips is a must when you do gypsy makeup. This makes you all the more mysterious and exotic. Gypsies are known to have dark hair that is long, thick and curly. So, if you have straight hair, you can curl your hair by using a curler. If your hair is naturally curly, you need not do anything. You may even choose beachy waves, which makes your hair wavy and beautiful. Another thing to remember is to tie a bright colored scarf on your hair, so that the curls fall beautifully under it. You can also have small braids in front of your face, so that they frame your face. Wearing a gypsy wig is another option. Now that you have completed the gypsy makeup, all that s remaining is the aroma that is so identical with the gypsies. You can choose oriental-floral, musk or sandalwood fragrances for this. This will enhance your look. Anything with a sensual scent or a hint of incense goes well with the gypsy look. One the makeup is over and you have worn the clothes that the gypsies usually wear, you are ready. Long and flowing skirts are identical with the gypsies and found in the wardrobe of every gypsy. They are usually bright colored with beautiful patterns. With the skirt you can wear a fitted top. Instead of a white tee, if you wear a top with sweetheart neckline and with some works on it, you will look better. An off-shoulder top will make you look more feminine. Along with the dress, you may wear sandals or flat boots with some glitter and also carry a clutch purse or a cross-body bag. You cannot imagine a gypsy without those large and oversized jewellery that make lots of clinking noise as they move around. So wear large hoop earrings made of gold or silver. With them wear necklaces made of beads and gold or silver bangles. You may also wear a large ring on your finger.